Two more interior trails on Isle au Haut are the Bowditch Trail and Long Pond Trail. The Bowditch Trail heads east from the Duck Harbor Trail, crossing a large marsh and ascending the forested Jerusalem Mountain and Bowditch Mountain. (Both "mountains" are barely noticeable hills.) Nearby Long Pond Trail is a lollipop loop that descends east to reach the shore of the thin north/south Long Pond. This might be the loneliest and least-visited stretch of trail in the Acadia National Park trail system. Both trails are pleasant walks in the woods but they are not destination hikes. 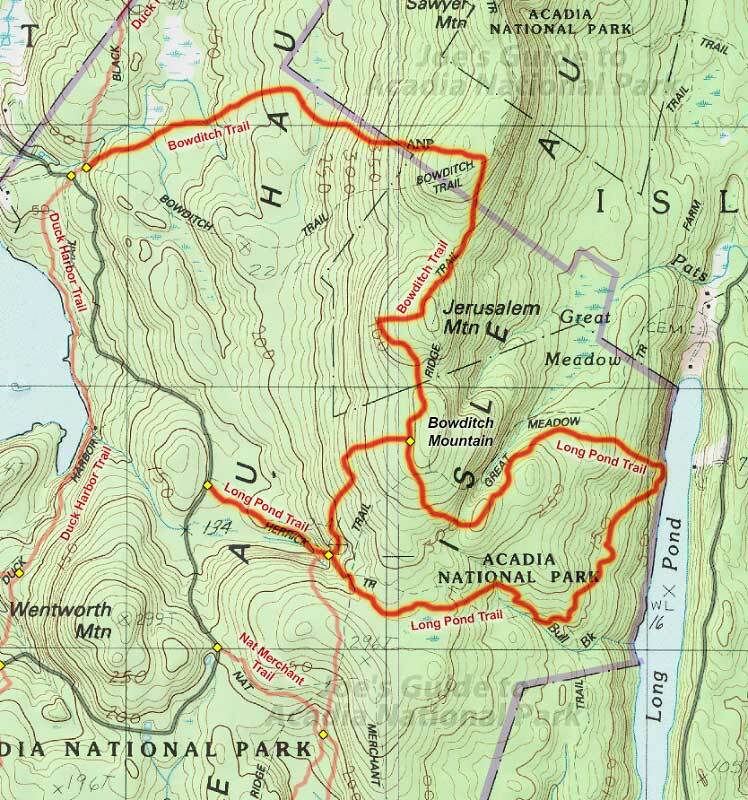 Note: Bowditch Mountain is named after Ernest Bowditch and his family for donating much of the land that is now Acadia National Park on Isle au Haut. 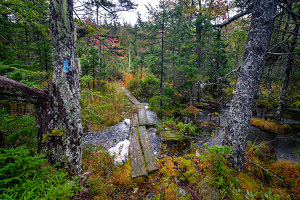 Long Pond Trail is a lollipop loop hike that can be accessed from the Duck Harbor Road, or you can connect to it via a longer hike from either the Bowditch Trail or Median Ridge Trail. (Note: This Long Pond Trail is not to be confused with the other Long Pond Trail located on the quiet side of Mount Desert Island.) Hiking Isle au Haut's Long Pond Trail as a counter-clockwise loop, the trail heads east through pleasant rolling hills where you may notice a few historic old stone walls and an interesting spot where many "dinosaur egg" stones are resting in the middle of the forest. 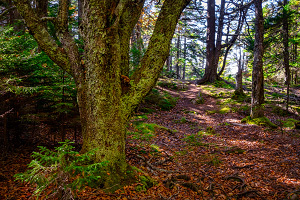 This stretch of trail is probably the loneliest and least-visited stretch of trail in the Acadia National Park system and there are several overgrown spots where you may have trouble following the trail. 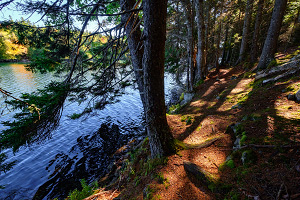 As the trail gets close to Long Pond, it makes a fairly steep descent to reach the forested shoreline. This is a great spot to relax and enjoy that get-away-from-it-all feeling. Continuing the loop, the trail leaves the pond and heads back west, making a fairly steep ascent to get back onto the main ridgeline of the island. Soon enough you will be back at the junction with the Bowditch Trail.